Early into the show, heavy rains caused water to seep into the first few rows, temporarily interrupting the show for several minutes as organizers moved people back to dry areas. But as they say, the show must go on, which it did. The Peanut Queen contestants introduced themselves on the runway and the crowd cheered for each girl during the ceremonious end to the 2018 Peanut Festival on Saturday, Oct. 13 at Grapeland’s Lorena Shoultz Auditorium. 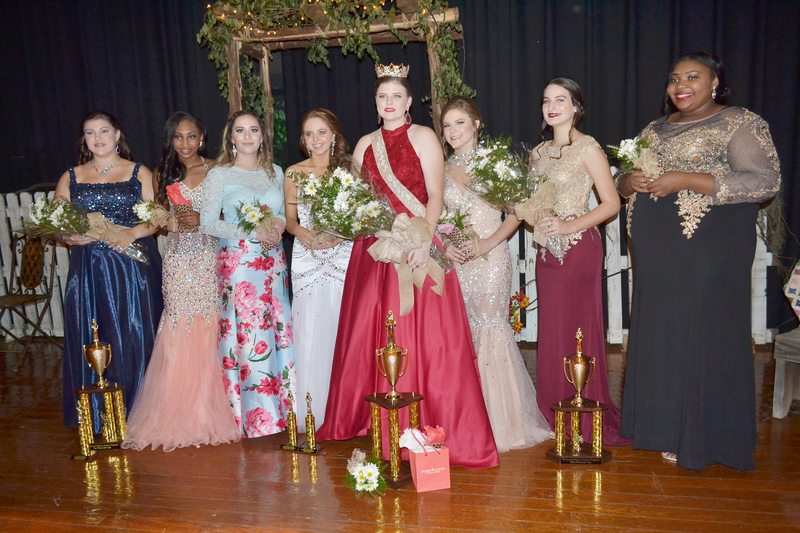 Following the competition themed “Sweet Country Living,” Miss Grapeland Noon Lions Club Carly Parker was crowned the 2018 Peanut Queen by last year’s queen, Madelyn Conner. First runner-up was Miss Frontier Camp Hannah Owens, who also won Most Photogenic. Second runner-up was Miss Parker’s Building Supply Abigaile Barrett. Miss Elite Fitness Taylor Pennington won the talent competition, as well as being named Miss Congeniality by the other contestants. Other contestants included Miss Grapeland Farm and Ranch Reagan Bishop, Miss Barkley Funeral Home Ragan Bowie, Miss Texas Bluegrass Association Alexia Lamb and Miss Rhone Funeral Home Haylee Reed. Owens sang “Before the Moon Was Round,” portraying a teenager who was reading from her journal, where she expressed the emotions the teenager was going through dealing with cancer. Bishop performed a skit explaining how she eliminated ideas of talents she could perform during the show based on what she was good and not-so-good at. Parker gave a monologue about golf, how the object of the game – strangely enough – is to play less. Reed gave a monologue about various diets popular today, while Lamb recited a religious poem. Entertainment during the show included the Texas College Choir singing a medley of songs in harmony, as well as a skit from the “Sweet Country Living Nursing Home” and a group of three young cloggers. After performing a skit together in their evening gowns, the Peanut Queen contestants sang “We’ll Meet Again,” asking the audience to join in. The Peanut Queen Coronation judges introduced during the show included Dr. Jan Taylor, assistant professor and director of choirs from Prairie View A&M University, actor and narrator Myron Willis and Miss Texas Rodeo 2017 Tianti Carter. Each contestant was judged in the categories of business wear, evening gown, physical fitness and talent. A personal essay sharing what living in the country has meant to her also was submitted by each contestant and read by the judges prior to the pageant. Contestants also were required to complete five hours of community service prior to Oct. 1. The Peanut Queen, first runner-up and second runner-up will each receive scholarship money. During the remainder of her senior year, the Peanut Queen will participate in numerous community events and will return in 2019 to serve as Peanut Festival parade grand marshal and crown the new queen at the 2019 pageant.